Scalping is a type of day trading technique that generally involves one placing small trades of short duration. Think of quickly getting in and getting out and limiting account exposure to prolonged, risky market activity. You are essentially sniping the market for the best trades. Because each trade likely has the goal to make profit on small movements, you will need multiple winning trades to make a decent profit. On average, you will place more trades with smaller profit targets and tighter stop losses. 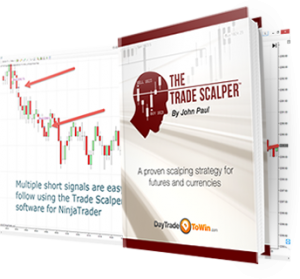 The Trade Scalper is designed to be a one-stop scalping solution. DayTradeToWin.com’s Trade Scalper accomplishes exactly what it sets out to do: teach you a powerful scalping technique using clear-cut rules. The strategy can be used with many types of markets, although instruction mainly focuses on the E-mini S&P. There’s nothing wrong with that, because the E-mini is one of the most popular futures in the world. The profit target averages around two to four ticks per trade. That’s around $50 to $100 per trade depending on volatility. Like other systems in the DTTW lineup, the Trade Scalper uses the ATR (Average True Range) to determine profit and stop. The maximum stop is six ticks. To be successful, the system has to be decisive on what trades are the best. You are taught how to avoid unsuitable conditions and to only go for the best signals. Speaking of signals, the Trade Scalper includes and indicator for NinjaTrader 8. This indicator provides entry signals that tell you to go short or long (buy or sell). The addition of directional triangles is a nice touch. There are two basic types of signals: a regular Long and Short and a Double-Wick (Dbl Wick) long or Short. There’s an option to turn off the Double-Wick signals. The software also provides horizontal and vertical lines that segment market activity. With a trained eye and some practice, you can see when a trade will occur. By the way, the strategy is fully disclosed in the included digital course. There’s no actual need to use the indicator. Remember that the strategy uses 1-min charts. Providing your charting platform can give you real-time 1-min charts and you understand the Trade Scalper well enough, you can manually find the trades on your platform of choice. This is why the Trade Scalper is one of the most popular trading systems for thinkorswim, MetaTrader, and MetaStock. Yes, it would good to support these other platforms. Perhaps one day, this will be available. With purchase, as mentioned, you receive the Trade Scalper course and software. An additional course is included, the X-5. This bonus focuses on finding moves caused by manipulation in the E-mini S&P market. It’s a good addition, as sometimes you may want a break from the fast-moving 1-min charts. The best value for a trading course offered by DayTradeToWin.com. The easy to use indicator, accurate strategy, and bonus course are an enticing package sure to please new and veteran traders alike.